In a thrilling end to the RC44 season, three races saw the leaderboard at the Calero Marinas RC44 World Championships turn inside out. Going into the final day Ironbound and Team Aqua had occupied the top of the leaderboard. Just nine points separated first from sixth, but after some exhilarating racing from the 15 strong RC44 fleet it was Team Ceeref which was crowned World Champion in Lanzarote. Peninsula Petroleum leapt from sixth to second. Team Aqua finished third winning the RC44 Championship Tour for the third consecutive year. Synergy’s Tactician Ed Baird described the conditions in Lanzarote as, “the most difficult venue on the tour” and “just crazy”. The teams were tested with different conditions in each race, a building breeze reached 15 knots by the series decider. Team Aqua had all but won the 2013 RC44 Championship Tour going into the final day, but they were aiming for the treble; the Match Racing Trophy, Fleet Racing Trophy and the World Championships - a feat not achieved in the RC44 fleet to date. The first race kicked off on time. Synergy wanted the right and it paid. Artemis Racing were over at the start and also headed right up the first beat, pulling their way back through the fleet. Gazprom Youth Challenge were also over early, but made a massive comeback. Overnight leaders Ironbound and Team Aqua were alone on the left side of the course, it didn’t pay and the pair trailed the fleet at the top mark. Synergy made no mistakes, leading from start to finish, moving Valentin Zavadnikov’s team into contention for the world title. Slovenia’s Team Ceeref followed their third place in race one with a win in the second. Leading from the start, they fended off a late charge by Team Italia, which banged the right hand corner on the second windward leg to pull up to second. Peninsula Petroleum slotted in a third place leaving the points going into the series decider incredibly tight. The Slovenian team now had a two-point lead over Team Aqua, everyone down to sixth placed Peninsula Petroleum still in with a chance of lifting the trophy. With the fleet bunched at the committee boat, Team Aqua and Peninsula Petroleum got the best starts. Michele Ivaldi made the call for Ceeref to tack straight off to the right, Peninsula playing the left, while Aqua stayed safe in the middle. At the top mark Peninsula led, Aqua fourth with the Slovenian team back in 13th. Ceeref made gains on the next two legs to round in front of Chris Bake’s team at the final windward mark, Aqua made the early gybe in search of places, but it didn’t pay. Team Ceeref’s sixth place was enough to hand Igor Lah’s team the World Championship title. Vasco Vascotto kept owner John Bassadone and Peninsula Petroleum in front of the fleet, to take the final race win, and with it second place in Lanzarote for the team. 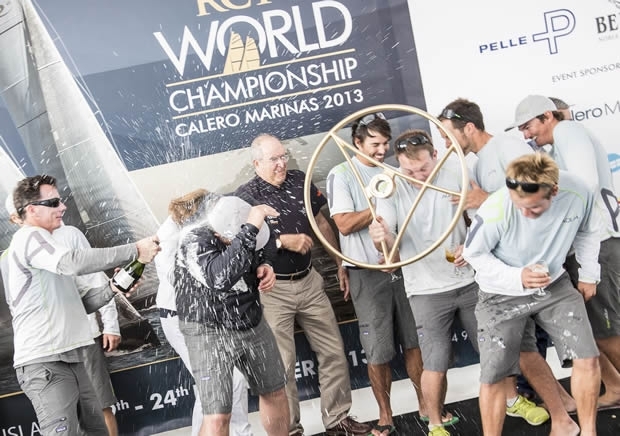 In the overall 2013 RC44 Championship Tour, Team Aqua was again crowned Champion for the third successive year. Synergy Russian Sailing team finished their season in second, with Katusha third. Tour winners, Team Aqua, have again proved themselves to be the most consistent team on the RC44 Circuit, but were clearly disappointed not to win the Worlds. Chris Bake, owner of Team Aqua, said: “We’ve had a great season again but it would have been nice to crown it off with the Worlds, they continue to be elusive for another year so maybe next year we will come back and fight again. We knew it was going to be tough and we knew that we had to go out and sail well and frankly we didn’t sail well enough to win. All things considered it’s a good result it just would have been nice to crown it.” The RC44 season will start in the Caribbean next February, where the class will be welcomed by the Yacht Club Costa Smeralda in Virgin Gorda. The full RC44 calendar will be announced by the end of November.